Evidently as I was posting a review of David Ackerman's Beyond the Lectionary the other day (see below), David was busy reviewing Greater Attention over at Amazon. 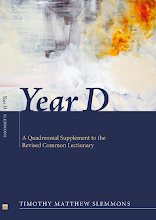 Singing the Lectionary ... Year D! Natalie Sims, the Lectionary Singer from down under, has linked to The Year D Project on her index, and as the slate is clean at this point, this would appear to be an opportune moment to chime in with your musical suggestions, either here, in the comments related to the Sunday in question, or by dropping her a line. Check out her website at the link (above and at the lower right). Welcome, Natalie! And thanks for the link! UPDATE: For those who may be interested in attacking the problem systematically, there is no better place to start than the Index of Lections. 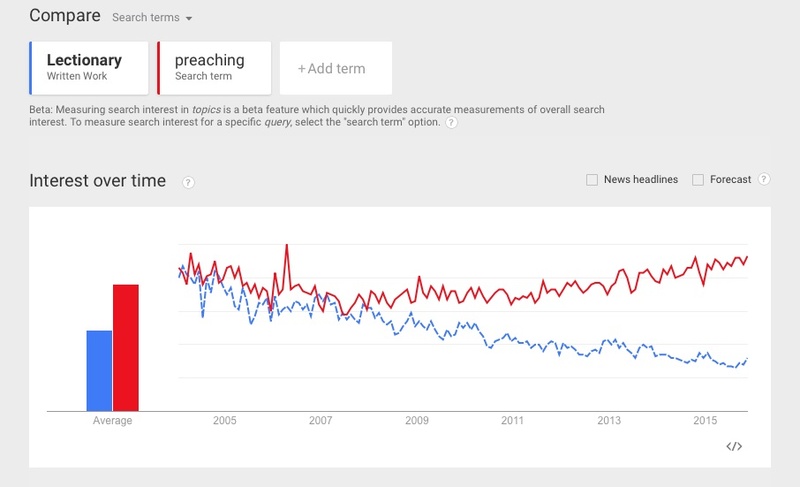 How many of these texts appear in the Scripture Indices of old hymnals and songbooks? Are any newer hymns, spirituals, "praise and worship" songs, or choral anthems rooted in these texts? Or if you are feeling really adventurous, how about setting yourself the challenge of writing and singing a new song to sing to the Lord based on these texts? Here is fresh inspiration for composers, arrangers, and songwriters. Go for it! In the front matter to Year D, I noted the evidence that the Spirit seems to be inspiring lectionary expansion on several fronts. Not long after Year D appeared, I learned of another one: David Ackerman's volume, Beyond the Lectionary, which was published earlier this summer on Circle Books. There are a number of admirable attributes to Ackerman's proposal that bear mentioning. 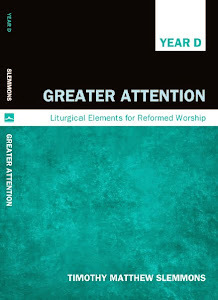 His appreciation for the strengths of the lectionary evinces a genuine fondness based on substantial experience with it over many years, indeed, many triennial cycles. One also admires his crisp and succinct case for moving beyond the lectionary's confines. Ackerman has done us the service of crunching the numbers and they are revealing: the RCL covers about a quarter of the Bible, but misses three-quarters. Yet, Ackerman's selection of texts, covering an additional seven percent or so, aims at qualitative precision, rather than quantitative coverage. While my aim in Year D is perhaps more suggestive, with a view to placing more possibilities on the desk and leaving the final cut to the preacher, Ackerman goes the extra mile, and draws the lines finely. Ackerman also shows, as I have tried to do, sensitivity to the liturgical season, and while his selections are arranged with a view to both "continuity" and (harmonious) "complementarity," one discerns a somewhat greater emphasis on the latter than the former. This perception is admittedly comparative; one does not, for instance, encounter such continuous arrangements of material as I have proposed for treating, e.g., Hebrews, the apocalyptic discourse, and the passion narratives. On the other hand, Ackerman's assignment of John 7–8 to Proper 14 through 23 leaps out as an example of both principles at work: continuity (despite the insoluble textual pickle of the woman caught in adultery) and thematic harmony (Ackerman's judgment in placing these chapters in closer seasonal proximity to the Festival of Booths than I have done is quite appropriate). One must further appreciate Ackerman's good sense solution to the problem presented by Christmas Eve, namely, what to read when all the nativity texts have been used. His wise answer: stick with Luke 2:1-20. Other dimensions of Ackerman's proposal are also inviting. His pairing of Daniel and Revelation in Advent and Reign of Christ, for example, shows a certain insistent and commendable pluck where the mainline seems to have almost washed its hands of this literature. Above all, however, is the devotional tone and structure of the book that renders it a welcome and pastoral source of nurture and inspiration for the lay reader and the preacher alike. As for points of critique, the main thing that Beyond the Lectionary lacks is a scripture index, which would add greatly to the utility of this helpful resource. While one appreciates the care with which Ackerman has targeted his selections, the quantitative question awaits a more comprehensive solution. How would he apply his careful, pastoral, devotional approach to the remaining two-thirds of the canon? The question should not detract from his worthwhile contribution, but simply clarify the fact that there remains much work to be done and ample material with which to do it. The canonical zone beyond the lectionary is a field of buried treasure, a promising source of spiritual and ecclesial renewal. It is both a delight and an encouragement to have David Ackerman as a co-laborer in this propitious field. but with godly pride, you know, as in "boasting in the Lord."